IN THE last 30 years, presenting to an audience has changed remarkably. Back then, it was called “oratory” and the aim was to impress your audience to establish authority. Today, the aim is to engage your audience to establish connection. The trouble is, most of the guidelines for presenting successfully to an audience were written years ago. For most people, this has become an obsession. “I mustn’t leave anything out” becomes your overriding thought when you have to make a presentation. You measure your success by how closely you match your script. You forget that the audience has not seen the script. The danger is that in focusing on getting the words right, you turn your delivery into something so boring that nobody wants to listen to it. You become more worried about recalling the words than resonating with the audience. Have a clear idea of the message you want to leave them with and some notes to refer to if necessary; but don’t worry about what you leave out — they’ll never know! They say that the human memory is a marvellous faculty that starts the moment we are born — and only stops when we stand in front of an audience to speak. Everyone goes blank. It is not the worst thing that can happen. If you lose your way, simply check your notes and refresh your memory. The audience will not think less of you for it. When I admitted to an audience that my mind had gone blank, they told me afterwards that it actually enhanced my credibility. Many speakers spend all their available preparation time writing their speech, when some research shows that as little as 7 per cent of the message the audience receives comes from those words. Up to 93 per cent of the message — and, certainly, a majority of the audience engagement — comes from the non-verbal component, specifically, the vocal component (the way you say the words) and the visual component (what they see). 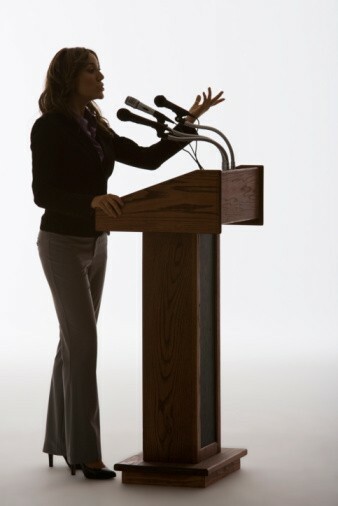 Write your speech early and spend a majority of your preparation time saying it aloud (paying attention to your pacing, emphasis and pauses) while standing up. Rehearsing your presentation in your head while sitting down is useless because the second you stand, you have changed the paradigm. You need to use every available moment to be saying the words aloud. You will notice how each time it sounds a little more natural. Practise standing up and use your actual presentation notes. The more familiar you are with them, the more easily you will refer to them. The most important part of the speech is the conclusion. What message do you want to leave your audience with? Write this first, then decide what is necessary to lead up to it. Practise similarly, so you know your conclusion better than the opening. Then, in your delivery, you are working towards the part you know best — which will build your confidence. A good hint is to break your presentation into its logical components and practise starting from anywhere in the presentation and working through to your conclusion. This way, you will be better able to recover should you get distracted. Audiences love stories. The narrative is inherently engaging. Many people have wasted hours watching “B” grade movies because the stories — even badly told ones — hook them. Your audience is also more likely to remember the story than any other part of your presentation. From your perspective, the story is the part of your presentation where you are least likely to lose your way or go blank. Stories are a guaranteed way to engage your listeners’ imagination and put images in their minds that will stick. Dr Alan Pavio showed several years ago that the images you put in an audience’s mind have eight times the retention level of the words you put there. Every good presentation needs a combination of logical and emotional content because logic makes people think but it takes emotion to get them to act. Stories are the easiest way to add emotional content to your presentation. Audiences today are harder to engage, easier to distract and have shorter attention spans than at any time previously. But use these hints and you will become more natural, spontaneous and engaging to any audience.